Added November 22, 2018 from Doug Eyolfson, MP - Charleswood-St. James-Assiniboia-Headingley. Added May 2, 2018 from Doug Eyolfson, MP - Charleswood-St. James-Assiniboia-Headingley. I rose in the House of Commons to share the important work Equal Opportunities West is doing to assist persons with disabilities to secure meaningful employment. Their staff is dedicated to making sure each individual in their program is given the opportunity to succeed and I’m proud to support their efforts in our community. I encourage everyone in Charleswood-St. James-Assiniboia-Headingley to stop by on June 9, drop off their e-waste, pick up a hot dog and say hi to the amazing staff, volunteers and participants at Equal Opportunities West. 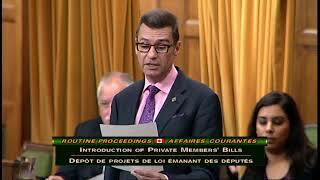 Yesterday marked the beginning of Motorcycle Safety Awareness Month and I rose in the House of Commons to provide brief remarks. As a motorcycle rider, Winnipeggers may see me riding my Triumph Bonneville down Portage Avenue or taking part in the upcoming Telus Motorcycle Ride For Dad Manitoba in support prostate cancer research. Riding a motorcycle is an exhilarating experience and I’m proud to be a part of a strong community of motorcycle enthusiasts in Winnipeg. But as an emergency room physician, I am all too familiar with the tragic consequences of motorcycle accidents and in every case a fatal accident could have been easily prevented. Safety is everyone’s responsibility. For fellow riders, when you make a plan, share the plan. Ensure your family and friends know where you’re going and ride with a buddy who can provide assistance in case of a breakdown and always ride sober and watch your speed. For motorists, we ask you to be alert and remember to check your blind spots for smaller and hard to see vehicles. By following these simple safety tips, the next life you could save, could be mine. 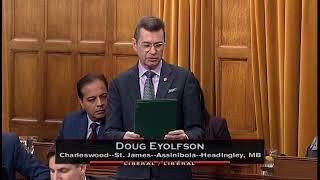 Added February 15, 2018 from Doug Eyolfson, MP - Charleswood-St. James-Assiniboia-Headingley. 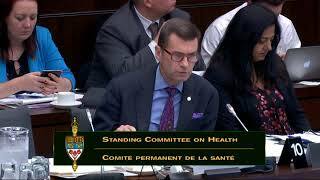 Yesterday, during our Standing Committee on Health meeting, I asked Ginette Petitpas Taylor, Minister of Health, if she is aware of any credible research that is not sponsored by tobacco companies or their paid lobbyists that make claims there are increases in contraband tobacco due to plain packaging. I followed up my first question by asking the Minister if she is aware of any non-tobacco company sponsored or tobacco lobbyist sponsored research that makes a credible case for plain packaging not working on decreasing smoking rates. I also inquired how long ago France initiated plain packaging and about trends or research indicating that those who have never smoked, who start vaping, are likely to go on to smoking tobacco. I thank the Minister for answering my questions and attending our committee meeting. 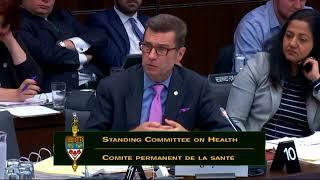 During our Standing Committee on Health meeting on Wednesday, I asked representatives from the Canadian Vaping Association and Vapeselect Inc. questions about vaping as we continue to study Bill S-5. 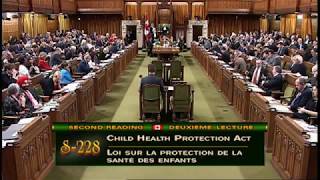 I'm happy to announce Bill S-228 - The Child Health Protection Act passed its vote at second reading in the House of Commons yesterday afternoon. This is an important step in eliminating the marketing of unhealthy food and beverages to children in Canada. 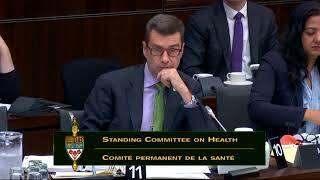 The bill will now be referred to the Standing Committee on Health for further review. Methamphetamine, more commonly known as crystal meth, is a serious public health issue in Canada and especially in Winnipeg where it has led to significant social and economic hardships for individuals, families and communities. As an emergency room physician, I would too often treat patients who overdosed on methamphetamine - many of whom experienced drug-induced psychosis. Pseudoephedrine, an easily procurable an over the counter decongestant, is a key chemical ingredient in methamphetamine. Oregon and Mississippi have introduced legislation to protect citizens by making medication containing pseudoephedrine prescription-only and have successfully reduced the amount of methamphetamine produced. This is why on Feb. 5, I sponsored e-petition 1497 which calls upon the Minister of Health to work with her provincial and territorial counterparts to make pharmaceuticals containing pseudoephedrine a prescription-only medication. Help me address this issue by adding your name to our petition at https://petitions.ourcommons.ca/en/Petition/Details?Petition=e-1497. 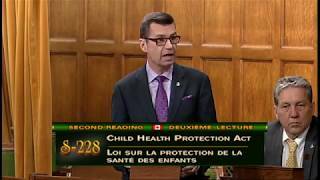 Dr. Doug Eyolfson, Member of Parliament for Charleswood-St. James-Assiniboia-Headingley, provides the closing statement during a debate on Bill S-228 - The Child Health Protection Act. As a physician, Eyolfson advocated for the elimination of marketing unhealthy foods and drinks towards children to reduce childhood obesity and reduce the risk of exposure to premature onset of chronic conditions and illnesses. The rapidly increasing rate of childhood obesity has become a matter of national concern in Canada. As Parliamentarians, it is our duty to stand up for those who are most vulnerable in our society and no group is more vulnerable than our children. The protection of children from the manipulative influence of marketing of unhealthy food and beverages is predicated on a pressing and substantial concern and calls for a federal legislative response. 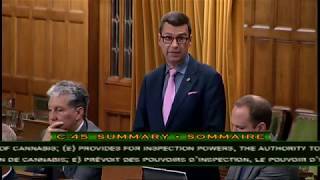 Bill S-228 is that response. 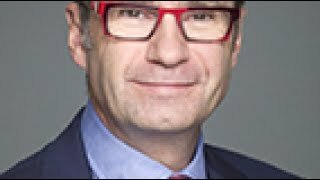 Added February 1, 2018 from Doug Eyolfson, MP - Charleswood-St. James-Assiniboia-Headingley. Yesterday, I had the pleasure of rising in the House to give a statement on supporting organizations that empower women in fragile states. I recently met with community leaders from the Canada Catholic Organization for Development and Peace, which educates Canadians about the plight of impoverished people and supports women in their search for social and economic justice. 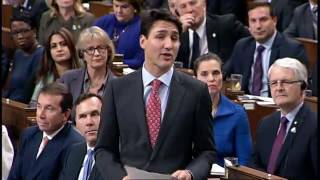 While we have made great strides, and this government is committed to making the involvement of women the priority in all of Canada's activities in fragile states to enable women and men around the world to have an equal voice and equal rights and to live equally in safety and security, more needs to be done. Women play a key role in conflict prevention and resolution as well as in building and sustaining an inclusive, lasting, and fair peace. When women are better represented in parliaments, those nations are significantly less likely to resort to violence in response to a crisis. This proves that a woman's place is in the House, in the Senate, and on the executive. Let us continue to commit to stand alongside women and organizations that strive to build a more just and peaceful world. 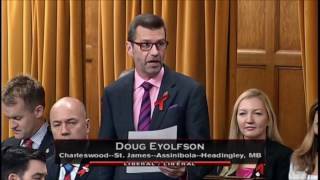 Added December 13, 2017 from Doug Eyolfson, MP - Charleswood-St. James-Assiniboia-Headingley. 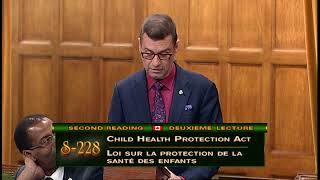 Dr. Doug Eyolfson, Member of Parliament for Charleswood-St. James-Assiniboia-Headingley, gives a speech on Bill S-228, the Child Health Protection Act, during the bill's first hour of debate. 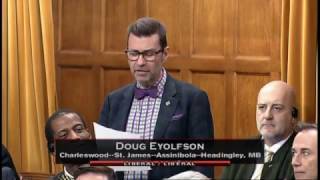 Dr. Doug Eyolfson, Member of Parliament for Charleswood-St. James-Assiniboia-Headingley, debates Bill S-228 in the House of Commons. MP Eyolfson proudly sponsor's Senator Nancy Greene Raine's Bill S-228. 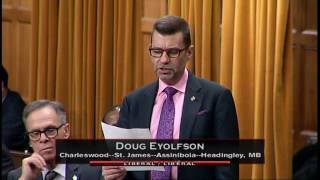 Added December 8, 2017 from Doug Eyolfson, MP - Charleswood-St. James-Assiniboia-Headingley. 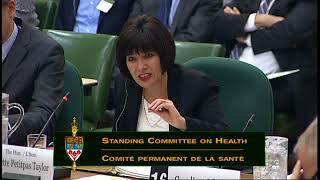 On Dec.7, during our Health Committee meeting, Dr. Doug Eyolfson, Member of Parliament for Charleswood-St. James-Assiniboia-Headingley, had the opportunity to ask Ginette Petitpas Taylor, the Minister of Health, about the actions our government has taken to address the opioid crisis. 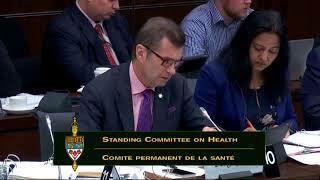 On Dec. 7, during our Health Committee meeting, Dr. Doug Eyolfson, Member of Parliament for Charleswood-St. James-Assiniboia-Headingley, had the opportunity to ask Ginette Petitpas Taylor, the Minister of Health, about the actions our government has taken to reduce the cost of pharmaceuticals for Canadians. Added December 1, 2017 from Doug Eyolfson, MP - Charleswood-St. James-Assiniboia-Headingley. 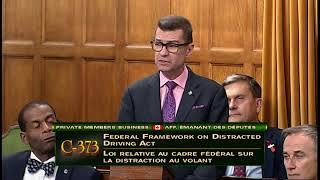 Yesterday, Dr. Doug Eyolfson, Member of Parliament for Charleswood-St. James-Assiniboia-Headingley, proudly rose in the House of Commons to debate his first Private Member's Bill, C-373, An Act Respecting a Federal Framework on Distracted Driving. Added November 8, 2017 from Doug Eyolfson, MP - Charleswood-St. James-Assiniboia-Headingley. Dr. Doug Eyolfson, Member of Parliament for Charleswood-St. James-Assiniboia-Headingley, rises in the House today to recognize the important work of Connie Newman and Doug Mackie, two outstanding individuals from the community. Connie Newman was bestowed the Manitoba Council on Aging Recognition Award for her tireless work with numerous advocacy groups for Seniors. Doug Mackie opened the first Men’s Sheds in Manitoba to create a community space where senior men can help each other get through difficult times. Members have credited Doug and Men's Sheds Manitoba. as having given their lives renewed purpose. 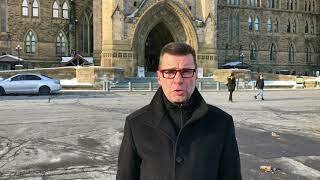 He was selected as one of the 150 Leading Canadians for Mental Health. 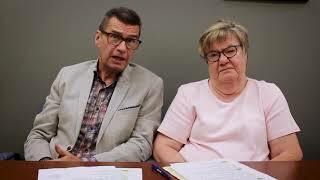 It is community members like Connie and Doug that define the best of Charleswood-St. James-Assiniboia-Headingley as a welcoming and inclusive place for all. Added November 2, 2017 from Doug Eyolfson, MP - Charleswood-St. James-Assiniboia-Headingley. 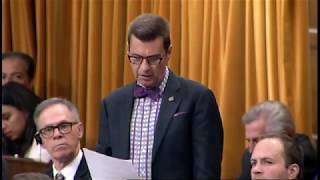 Dr. Doug Eyolfson, Member of Parliament for Charleswood-St. James-Assiniboia-Headingley, rises in the House to discuss the Cannabis Act and answer questions. 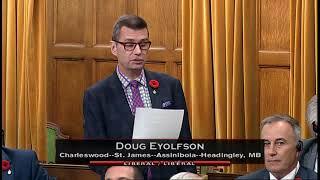 Added October 19, 2017 from Doug Eyolfson, MP - Charleswood-St. James-Assiniboia-Headingley. 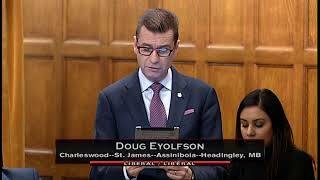 Doug Eyolfson, Member of Parliament for Charleswood-St. James-Assiniboia-Headingley tables his Private Members Bill C-373, An Act Respecting a Federal Framework on Distracted Driving, in the House of Commons. Added October 6, 2017 from Doug Eyolfson, MP - Charleswood-St. James-Assiniboia-Headingley. DescriptionDr. 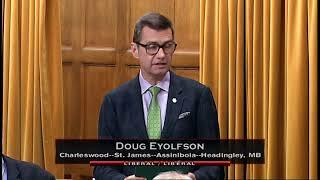 Doug Eyolfson, Member of Parliament for Charleswood-St. James-Assiniboia-Headingley tabled Senator Nancy Greene Raine’s Senate Public Bill S-228 in the House of Commons. Senator Greene Raine’s Senate Public Bill seeks to amend the Food and Drugs Act in an effort to fight childhood obesity by prohibiting the marketing of unhealthy food and beverages marketing towards children. Added October 3, 2017 from Doug Eyolfson, MP - Charleswood-St. James-Assiniboia-Headingley. 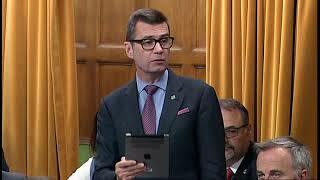 Dr. Doug Eyolfson, Member of Parliament for Charleswood-St. James-Assiniboia-Headingley, asks Seamus O'Regan, Minister of Veterans Affairs, what the government is doing to address the invisible injuries of our men and women and their families. Added September 18, 2017 from Doug Eyolfson, MP - Charleswood-St. James-Assiniboia-Headingley. 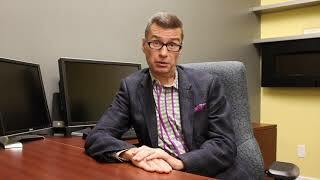 Dr. Doug Eyolfson, Member of Parliament for Charleswood-St. James-Assiniboia-Headingley, asks experts from the Colorado Department of Public Health and Environment and Johns Hopkins University questions about problems with edible cannabis products and packaging as the Standing Committee on Health continued their review of Bill C-45 - The Cannabis Act. Added September 15, 2017 from Doug Eyolfson, MP - Charleswood-St. James-Assiniboia-Headingley. 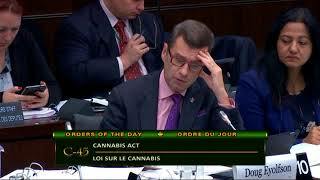 Dr. Doug Eyolfson, Member of Parliament for Charleswood-St. James-Assiniboia-Headingley, asks an expert from Tousaw Law Corporation questions about pricing as the Standing Committee on Health continues their review of Bill C-45 - The Cannabis Act. 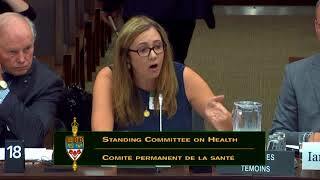 Dr. Doug Eyolfson, Member of Parliament for Charleswood-St. James-Assiniboia-Headingley, asks experts from the Non-Smokers' Rights Association, the Atlantic Convenience Store Association and the University of Waterloo as the Standing Committee on Health continues their review of Bill C-45 - The Cannabis Act. 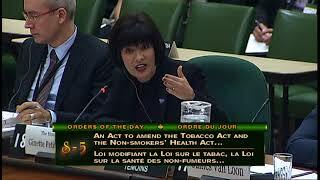 Dr. Eyolfson asks questions about packaging and tobacco lobbying. Dr. Doug Eyolfson, Member of Parliament for Charleswood-St. James-Assiniboia-Headingley, asks experts from the Métis National Council and Chiefs of Ontario as the Standing Committee on Health continues their review of Bill C-45 - The Cannabis Act during a panel on Indigenous communities. Dr. Eyolfson asks questions about the current criminalization strategy and if it targets Indigenous groups and if mental health funding allocated by the Government of Canada will help address root causes of problems. 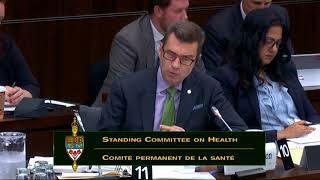 Dr. Doug Eyolfson, Member of Parliament for Charleswood-St. James-Assiniboia-Headingley, asks experts from the New Brunswick Medical Society and New York University questions as the Standing Committee on Health continues their review of Bill C-45 - The Cannabis Act. Dr. Eyolfson asks questions about increase in cannabis usage after legalization and pricing. 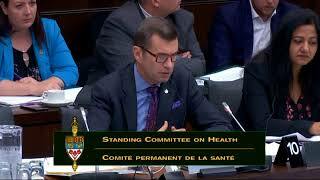 Dr. Doug Eyolfson, Member of Parliament for Charleswood-St. James-Assiniboia-Headingley, asks experts from Gabor Mate Consulting and the City of Toronto questions as the Standing Committee on Health continues their review of Bill C-45 - The Cannabis Act. Dr. Eyolfson asks questions about prevention of drug disorders and impaired driving due to Cannabis usage. 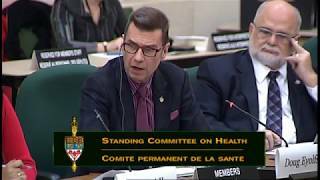 Dr. Doug Eyolfson, Member of Parliament for Charleswood-St. James-Assiniboia-Headingley, discusses whether or not cannabis is a gateway drug with an expert from Drug Free Canada as the Standing Committee on Health continues their review of Bill C-45 - The Cannabis Act. 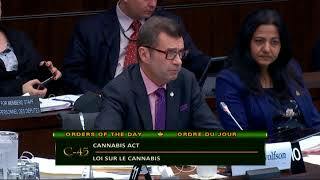 Dr. Doug Eyolfson, Member of Parliament for Charleswood-St. James-Assiniboia-Headingley, asks experts from Drug Free Canada and Institut national de santé publique du Québec questions as the Standing Committee on Health continues their review of Bill C-45 - The Cannabis Act. Dr. Eyolfson asks questions about packaging and if legalization will reduce some of the stigma around cannabis usage and stimulate more research from an addictions and medical standpoint. 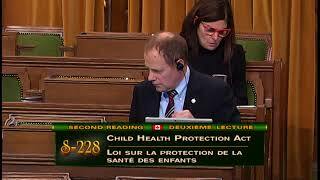 Dr. Doug Eyolfson, Member of Parliament for Charleswood-St. James-Assiniboia-Headingley, asks experts from the Canadian Paediatric Society and Portage questions as the Standing Committee on Health continues their review of Bill C-45 - The Cannabis Act. Dr. Eyolfson asks why young people are smoking cannabis at the rate they do and what would be the most effective way to transmit messages to young people about cannabis usage. 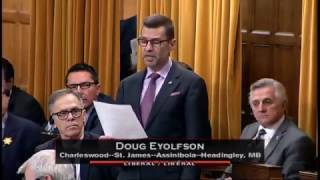 Added September 13, 2017 from Doug Eyolfson, MP - Charleswood-St. James-Assiniboia-Headingley. Dr. Doug Eyolfson, Member of Parliament for Charleswood-St. James-Assiniboia-Headingley, asks experts from Smart Approaches to Marijuana and Freedman and Koski Inc. questions as the Standing Committee on Health continues their review of Bill C-45 - The Cannabis Act. Dr. Eyolfson asks questions about difference in pricing between the legal and black markets and reversing legalization. 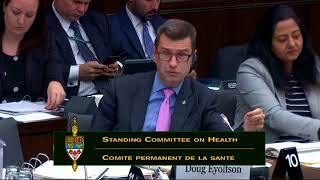 Dr. Doug Eyolfson, Member of Parliament for Charleswood-St. James-Assiniboia-Headingley, asks experts from the Washington State Liquor and Cannabis Board, the Colorado Department of Revenue and the University of Denver questions as the Standing Committee on Health continues their review of Bill C-45 - The Cannabis Act. Dr. Eyolfson asks questions about adulteration of cannabis and controlled sale models. 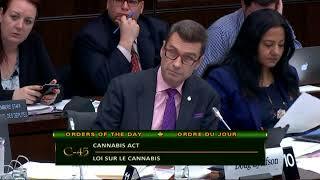 Dr. Doug Eyolfson, Member of Parliament for Charleswood-St. James-Assiniboia-Headingley, asks legal experts questions as the Standing Committee on Health continues their review of Bill C-45 - The Cannabis Act. Dr. Eyolfson asks questions about decriminalization vs. legalization; difficulties for residential property owners who would ban growing cannabis; and refers to statistics. 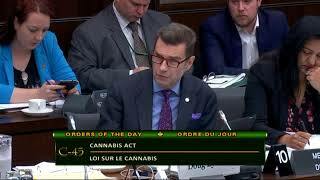 Dr. Doug Eyolfson, Member of Parliament for Charleswood-St. James-Assiniboia-Headingley, asks police officers from across Canada questions as the Standing Committee on Health continues their review of Bill C-45 - The Cannabis Act. Dr. Eyolfson asks questions about youth cannabis usage; home cultivation; and home much additional training will be needed for officers to recognize grow ops. Added September 12, 2017 from Doug Eyolfson, MP - Charleswood-St. James-Assiniboia-Headingley. 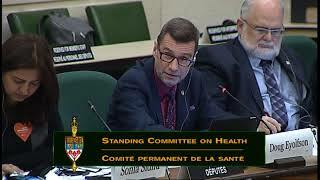 Dr. Doug Eyolfson, Member of Parliament for Charleswood-St. James-Assiniboia-Headingley, asks experts from the Departments of Public Safety and Emergency Preparedness and The Canadian Medical Association questions as the Standing Committee on Health begins their review of Bill C-45 - The Cannabis Act. 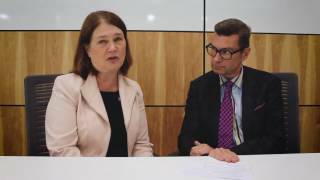 Dr. Eyolfson asks questions about ticketing; risk of significant harm to youth 18 to 21 who might obtain cannabis illegally; would youth age 18 to 21 use cannabis any less if the age limit was increased to age 21; and if we have learned anything from the alcohol prohibition example despite it being 100 years old. 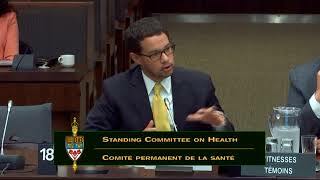 Dr. Doug Eyolfson, Member of Parliament for Charleswood-St. James-Assiniboia-Headingley, asks experts from the Departments of Health and Justice questions as the Standing Committee on Health begins their review of Bill C-45 - The Cannabis Act. Dr. Eyolfson asks questions about home cannabis cultivation; how the legislation might affect business operations of retailers who sell cannabis-related accessories; and if someone living in a province who has yet to set regulations can obtain cannabis through a mail order system. 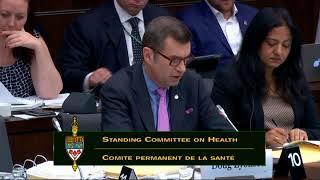 Dr. Doug Eyolfson, Member of Parliament for Charleswood-St. James-Assiniboia-Headingley, asks experts from the Departments of Health and Justice questions as the Standing Committee on Health begins their review of Bill C-45 - The Cannabis Act. Dr. Eyolfson talks about his time working in emergency room medicine and his experiences witnessing how cannabis kills through criminal activity of the drug trade. Dr. Eyolfson asks if differing age restrictions between provinces could pose a public safety issue; what estimated policing costs are for cannabis-related crimes; and if United States Border Services agents have access to records for ticketing offenses when Canadians cross the border. 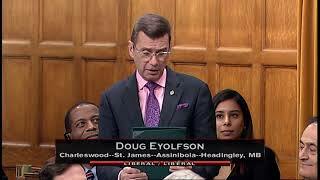 Added August 25, 2017 from Doug Eyolfson, MP - Charleswood-St. James-Assiniboia-Headingley. 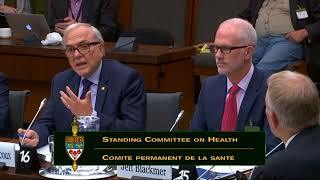 In September, I will be reviewing Bill C-45, the Cannabis Act, with my colleagues on the Health Committee. Before we begin our review, it is important for me to hear your views on this subject. Visit https://goo.gl/1Zk5Sk to share your thoughts. Please share this video with your friends and family, so they can add their voice. 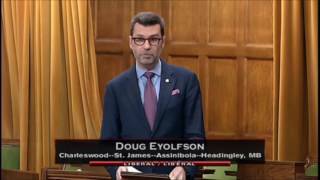 Added August 16, 2017 from Doug Eyolfson, MP - Charleswood-St. James-Assiniboia-Headingley. On Aug. 22, I will be hosting a community consultation on a National Seniors' Strategy at the St. James Assiniboia 55+ Centre. Please share this video with your friends and family and I hope to see you there. 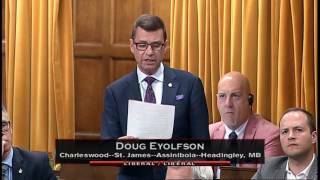 Added August 3, 2017 from Doug Eyolfson, MP - Charleswood-St. James-Assiniboia-Headingley. Join me on Tuesday, August 29, 2017 for a Town Hall on Cannabis Legalization and Regulation at the St. James Civic Centre from 6:30 p.m. to 8:30 p.m.
Added June 15, 2017 from Doug Eyolfson, MP - Charleswood-St. James-Assiniboia-Headingley. Today I rose in the House and asked Patty Hajdu, the Minister of Employment, Workforce Development and Labour, about what steps our Government is taking to help students in Charleswood-St. James-Assiniboia-Headingley and across Canada who are entering the skilled trades. I am glad that we are making investments in the Union Training and Innovation Program, in Indigenous job training, and expanding the Canada Student Loans and Grants program to help Canadians pay for their education and pursue their studies in the skilled trades. 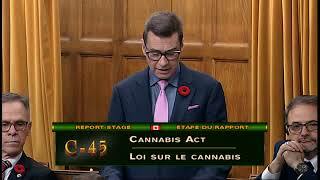 Yesterday I had the privilege of standing in the House of Commons and speaking in favour of C-45, the Cannabis Act. The prohibition on cannabis has failed and it is time that we took an evidence-based approach. This legislation lays the framework for regulating cannabis to make it harder for our youth to acquire marijuana, enable strict safety and quality requirements and stop organized criminals from profiting from its sale. It was my honour to stand in the House of Commons and extend a warm welcome to all those participating in the Manito Ahbee Festival and commend the organizers for their important work in helping Canadians celebrate Indigenous culture and heritage. If you have asked yourself what you can do in this time of reconciliation and healing, consider this your official invitation to Manito Ahbee. Doug Eyolfson, MP for Charleswood-St. James-Assiniboia-Headingley recognized constituent Valerie Christie's volunteerism and contributions to the community, and her receipt of the Governor General's Sovereign Medal for Volunteers this January. 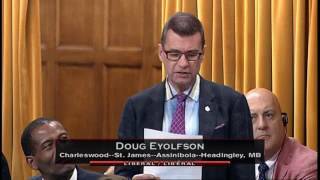 Doug Eyolfson, MP for Charleswood-St. James-Assiniboia-Headingley made a statement about the current flood situation in Manitoba, reflecting the Government of Canada's first priority is ensuring that the First Nations communities who’ve been affected are safe, secure and out of the path of flood waters. He also thanked the Canadian Red Cross who assisted in the evacuations, and the first responders who have worked tirelessly to keep Manitobans safe from the flooding. 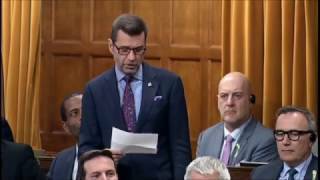 On February 13, 2017 I asked my colleague Steven MacKinnon, Parliamentary Secretary to the Minister of Public Services and Procurement and MP for Gatineau, about the investments the Government of Canada is making in aerospace, both locally at StandardAero in my riding as well as nationally, which will support our Canadian Armed Forces. On February 9, 2017, Dr. Doug Eyolfson, MP for Charleswood-St. James-Assiniboia-Headingley delivered a statement recognizing swimmer and Olympian Rhiannon Leier-Blacher's induction into the Manitoba Sport Hall of Fame, and her significant contributions to sport and the community in Manitoba and across Canada.